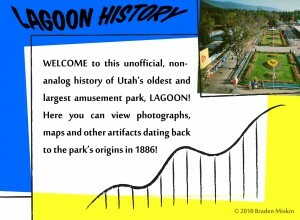 I’ve been interested in the history of Lagoon ever since I knew it had one. Of course, I’ve always been interested in amusement parks as well as the history behind things so it makes sense that I’d want to know more about the park I’ve visited many times since I was a kid. My first successful website devoted to the park was created in 2001. It slowly developed into a valuable resource for those who sought to know more about the park (which I quickly found out were very numerous). I started out by simply providing what information I had and over the years, visitors offered corrections and new information and photos until soon I was receiving emails from all kinds of people requesting more information. These emails came from elementary to college-aged students, local historians, amusement park enthusiasts from Europe and even an archaeologist studying former establishments across the east shore of the Great Salt Lake. The site inspired many others to create their own websites, many of which copied information directly from mine, but didn’t last long. I would often try to redesign the entire site and soon found that the site was splitting two different directions. There was the history side dealing with the park’s past. But then there was all the news, current information and a growing community of people who enjoyed going to Lagoon. One other website, started by a former employee of Lagoon, a member of my site, and – as I later found out – a coworker of mine started his own group which has become the best source of news and current information about the park. It was hard for me to stay updated on changes and additions when I lived 3 hours away and with college I had less and less time to work on it. So I decided to stick to the historical side of things. This new website, LagoonHistory.com, is probably the 5,379th version of my website and it will focus more on old photos and other artifacts that provide a look at what Lagoon used to be like. It also gives me a chance to work on new designs. 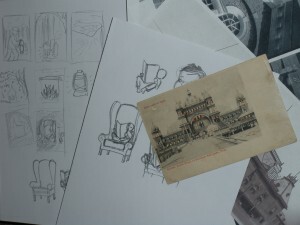 It will feature a history of the park during different periods of its existence. The sample above was inspired by books and other print materials from the late 1950s and early ’60s. 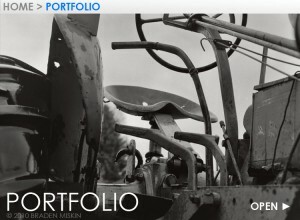 I’ve begun work on the Portfolio section of my website. Only a couple pages as of the time of this post, but many more are to come. Let me know what you think about the look and design. The menu bar at the top is something I’m considering for the entire website as well. It’s been a month, so I guess it should be time for another weekly update, right? Well, my current project is taking a lot more time than I anticipated. But don’t worry, I’ll be back on track soon.